dGSEA is supposed to conduct gene set enrichment analysis given the input data and the ontology in query. It returns an object of class "eTerm". the ontology supported currently. It can be "GOBP" for Gene Ontology Biological Process, "GOMF" for Gene Ontology Molecular Function, "GOCC" for Gene Ontology Cellular Component, "PS" for phylostratific age information, "PS2" for the collapsed PS version (inferred ancestors being collapsed into one with the known taxonomy information), "SF" for domain superfamily assignments, "DO" for Disease Ontology, "HPPA" for Human Phenotype Phenotypic Abnormality, "HPMI" for Human Phenotype Mode of Inheritance, "HPCM" for Human Phenotype Clinical Modifier, "HPMA" for Human Phenotype Mortality Aging, "MP" for Mammalian Phenotype, and Drug-Gene Interaction database (DGIdb) and the molecular signatures database (Msigdb) only in human (including "MsigdbH", "MsigdbC1", "MsigdbC2CGP", "MsigdbC2CP", "MsigdbC2KEGG", "MsigdbC2REACTOME", "MsigdbC2BIOCARTA", "MsigdbC3TFT", "MsigdbC3MIR", "MsigdbC4CGN", "MsigdbC4CM", "MsigdbC5BP", "MsigdbC5MF", "MsigdbC5CC", "MsigdbC6", "MsigdbC7"). Note: These four ("GOBP", "GOMF", "GOCC" and "PS") are availble for all genomes/species; for "Hs" and "Mm", these six ("DO", "HPPA", "HPMI", "HPCM", "HPMA" and "MP") are also supported; all "Msigdb" are only supported in "Hs". For details on the eligibility for pairs of input genome and ontology, please refer to the online Documentations at http://supfam.org/dnet/docs.html. Also supported are the user-customised gene sets; in doing so, the option "Customised" should be used together with the input of the next parameter "customised.genesets"
the characters to tell the location of built-in RData files. By default, it remotely locates at https://github.com/hfang-bristol/RDataCentre/blob/master/dnet and http://dnet.r-forge.r-project.org/RData. Be aware of several versions and the latest one is matched to the current package version. For the user equipped with fast internet connection, this option can be just left as default. But it is always advisable to download these files locally. Especially when the user needs to run this function many times, there is no need to ask the function to remotely download every time (also it will unnecessarily increase the runtime). For examples, these files (as a whole or part of them) can be first downloaded into your current working directory, and then set this option as: RData.location=".". Surely, the location can be anywhere as long as the user provides the correct path pointing to (otherwise, the script will have to remotely download each time). Here is the UNIX command for downloading all RData files (preserving the directory structure): wget -r -l2 -A "*.RData" -np -nH --cut-dirs=0 "http://dnet.r-forge.r-project.org/RData"
set_info: a matrix of nSet X 4 containing gene set information, where nSet is the number of gene set in consideration, and the 4 columns are "setID" (i.e. "Term ID"), "name" (i.e. "Term Name"), "namespace" and "distance"
gs: a list of gene sets, each storing gene members. 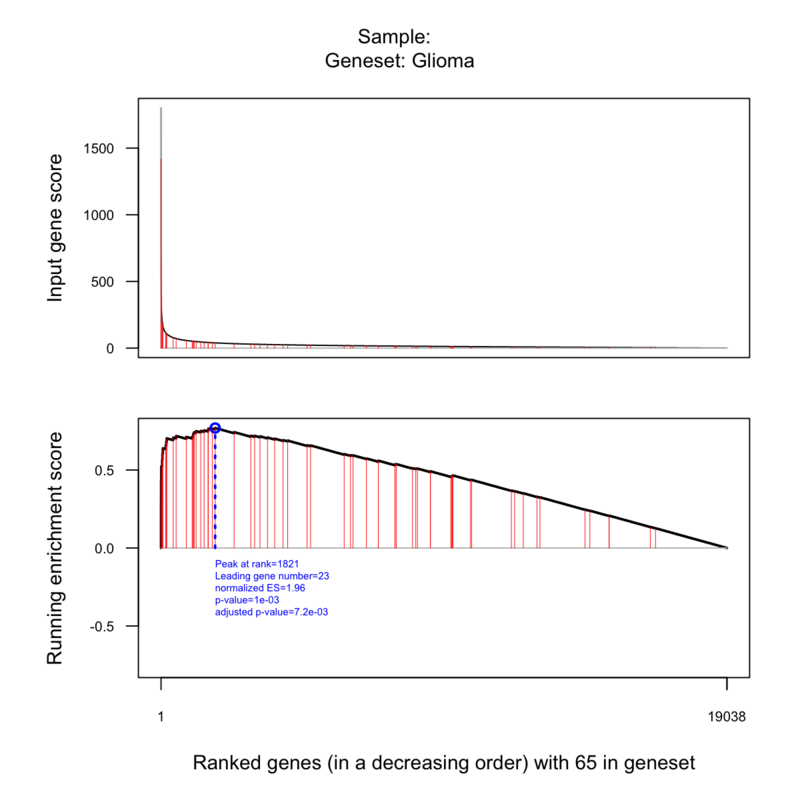 Always, gene sets are identified by "setID" and gene members identified by "Entrez ID"
"qvalue": q value is the monotunically increasing FDR so that the higher "nes", the lower "qvalue". A file called eTerm.txt has been successfully written!